Home National San Jose Metro: Futuristic Vision, or Pipe Dream? San Jose Metro: Futuristic Vision, or Pipe Dream? The Metro is an efficient transport system, but very expensive! Once again the idea, dream or vision of a Metro (subway) for San Jose is being talked about. And although everyone agrees that a Metro would be an efficient transport system for Costa Rica’s capital city, moving a large number of people, without affecting road or pedestrian traffic, it is very expensive. In terms of the cost, San Jose would have less expensive labor than European or North American cities, which would help control expenses. Even so, it is the most expensive public transport system, since construction requires heavy machinery, whose cost is the same everywhere in the world. It is also not possible to know in advance what obstacles the excavation of the tunnels would face, such as a rock formation or groundwater, which would raise the cost. Presidential candidate Carlos Alvarado supports an underground subway. So does former presidential candidate Rodolfo Piza who has in the past week given his support to Carlos. And besides the cost, estimated at US$100 million dollars per kilometer, almost no subway in the world generates enough income to cover the construction cost. The cost per kilometer varies greatly. A $1 billion dollars doesn’t go very far in subway construction these days. Look at New York, the Second Avenue Subway cost US$2.5 billion a mile (US$1.56 billion per kilometer) in 2017. 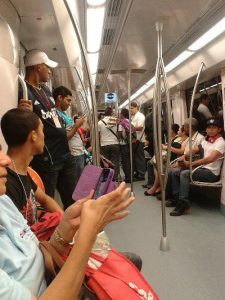 The Panama Metro (Spanish: Metro de Panamá) in Panama City, a partially underground, partially elevated 15.8-kilometer (9.8 miles) line, cost US$1.452 billion. Panama’s Line 1 was inaugurated on April 5, 2014. For this reason, less dense cities often prefer light rail, which averages a fraction the cost of subways. The cost per kilometer of the track for an electric surface train is around US$10 million. And can often be part of highway projects. Carlos Alvarado, who is seeking to be Costa Rica’s next president come April 1, says the development of the mass transport passenger rail mode in the GAM will be carried out in stages. The plan is to advance in two stages: the construction of the rapid passenger train that connects San José, Alajuela, Cartago and Heredia and in parallel, studies will begin for the subway that connects Desamparados, Guadalupe and San José. Former presidential candidate Rodolfo Piza of the PUSC explains, “At first the fare would not cover the entire loan rate (cost), but as the years go by, the demand will increase.” Piza added his plan doesn’t propose a big system like in Panama. “I have no problem in that the country assumes financial responsibilities to invest in public works because that generates development and jobs,” said Piza who could form part of Carlos Alvarado’s inner circle or government, if elected.